Help support Disabled Veterans and Families in need of Service Dog's! All proceeds from the Paws O' Freedom go to support our cause. This is a VIRTUAL RUN! Which means no official race site, and no official race time! No early wake up times and you get to sleep in your bed. However you are on the Honor System. From June 1st to July 4th, you can run, walk, skip, low crawl, or perform your 5K however you'd like! You pick when, where, and how you want to finish your 5K. You can even combine this event with another race you're doing!!! 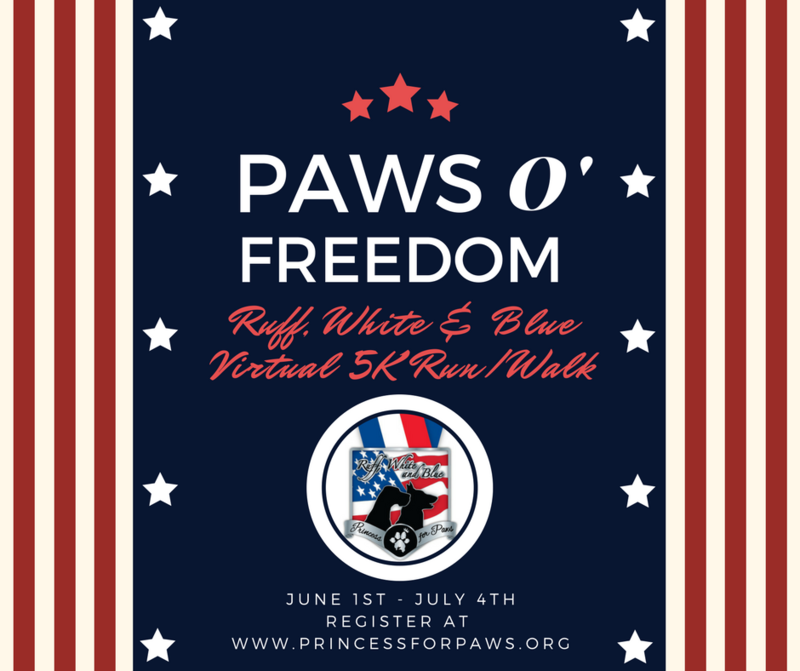 We do have one request, we ask that you take a picture of yourself (safely) while doing your run and post it to our facebook page, www.facebook.com/princessforpawsonslow. If you are able to include your dog, it'll make it even better (we are a dog charity after all). All participants will receive a commemorative medal within 2 weeks of the end date for the event.